That raises the question of the image's truth. Or from under his mountain. —Wallace Stevens, A Mythology Reflects Its Region. Actions grow out of belief. Beliefs grow out of the ecosystem of our collective lives known as cultures. Cultures are organic in this way: they sprout, grow, bloom, bear fruit, and fade in accordance with the climes and terrain of their times. 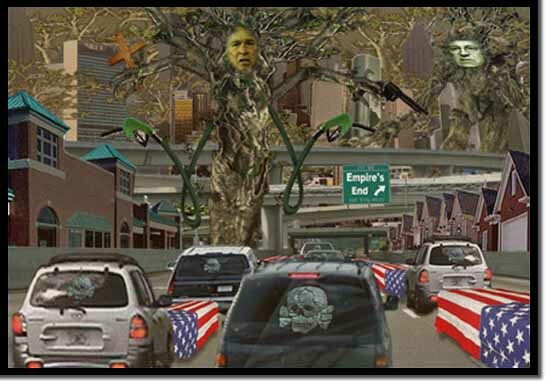 America now grows -- paranoia -- It is our national plant. A strange genus of this plant grows across the land... It started out as a small hybrid, a member of the Bush family, growing mostly in southern and western states. Though some theories hold that its origins were in Maine -- and that it was transplanted to Texas where it spread, unchecked, due to the fact that there are few herbivores in the region to keep its growth in check. In the dry soil of Texas, it grew dense and thorny, thriving when watered with blood and oil. Unpruned and unregulated, it grew thicker than an oak, larger than a redwood: It became... a Paranoia Sequoia, growing ever larger in the hot greenhouse gases of global climate change, its massive branches spread across the world, casting a shadow of fear beneath it. And it has bore strange fruit, indeed -- and numerous assorted nuts, of course. Though its oily wood limits its use as timber: Its wood is mostly suitable for crucifixes and coffins...but, due to its oily base, it can be used to build a bonfire large enough to set the world ablaze. At present, the people of the United States are lost in a dark woods overgrown by these sun-occluding trees. Some among us have taken to eating mushrooms sprouting from the forest floor. Upon ingestion, they see strange visions of an old woodsman named Ralph the Gruff who -- they have come to believe -- will fell the entire, dark forest with his one ax.... I must confess: I wish drugs still had this powerful effect on me. Others, in their desperation, dream that Sir John of Massachusetts, mounted upon his steady donkey of war, will come riding to the rescue and lead us from this dark and terrible place. Unfortunately, these folks can't even blame their hallucinations on the mind-bending effects of mushrooms. The 14th century poet, Dante Alighieri found himself hopelessly lost in a metaphorically similar, dark woods -- Happily, it only turned out to be the entrance to Hell. For the secular, Hell is not a literal place -- but, instead, it exists as a psychological landscape, an acute awareness of the world we have created by way of the sins of our self-centeredness. In order to find our way though these dark and dangerous woods of the collective American mind -- and then to begin to navigate our way through the Hell of our cultural delusions -- we don't need Ralph or John -- like Dante -- we need Virgil. In other words, we need poets -- not politicians -- as guides. The poet's vision allows us to divine those aspects of consciousness that exist beyond the quotidian patterns of everyday life, to live beyond ourselves, to, when necessary, peer into the forbidding darkness where the constraints of our daylight "realities" do not allow us to venture. singing, praising, to realize the harmony in your strings. Poetry permits us to eavesdrop on the hellish aspects of our selves that we believe we must cast out, because we have been taught to believe they are too wild, ineffable, crude, chaotic, angry, silly, morose, monstrous, or simply too out-and-out inappropriate to be of any use to us or the community at large. But, ironically, these subterranean thoughts still rule our actions, shifting the landscape of our beliefs like the movements of tectonic plates. This is why the United States has grown so dangerous: Our obsessive efforts to quell the chaos within ourselves have been turned outward in a vain effort to subdue all the things of the world we find unsettling.... We see enemies everywhere.... The peace must be protected by waging perpetual war. Give me an example of this, you ask.... Provide me with a concrete example of how our hidden beliefs manifest themselves in our actions -- actions that engender consequences that are in exact opposition of our stated intentions? How about this, as an example? We hear, quite often, the pronouncement: "Americans are a peace-loving people.... We only go to war when we are given no other choice." Yet, we still view ourselves as a peace-loving people. We delude ourselves, believing that -- through the machinations of some shadowy process "beyond our control" -- a constant stream of intransigent enemies just happen to incessantly arise who are hell-bent on drawing us into perpetual battle -- and these evil-doers, contrary to our deepest desires, force us, again and again, to don the untarnished armor of the reluctant warrior and ride into the bloody breach to meet them. Furthermore: We have yet to have cocked our ear towards the chasms of Hell, where the homunculi of our most hidden desires howl, bleat and plead. If we did -- we might hear them giving voice to our hidden aspirations and agendas: "Of paramount importance -- the end all/ be all of all things -- is my comfort level. All things must exist to serve this end," they would implore. Yet a dreadful knowledge gnaws beneath the surface of our awareness: Because, at a deeper level -- we Americans realize that in order to live in the manner to which we have become accustomed -- we must continue to plunder the resources of the world at a rapacious rate. For, beneath it all, we know that our actions are not only unethical -- but unsustainable. Our daylight minds cannot and will not grasp this fact; its implications are too overwhelming.... The knowledge -- that we maintain "our way of life" on the bartered blood of the innocent -- is too unnerving. The implications of gaining such awareness would be too damning; hence, we banish such thoughts to the darkest regions of our unconscious.... but they arise as a host of diffuse anxieties and distorted fears. Plus: the dilemma is steeped in a terrible irony: for the more anxious we grow -- the more desperate we become for reassurance. And what do we find reassuring? -- Well, of course, the life we have always known.... It must be maintained. Therefore: We crave an even greater level of comfort: Our gas-guzzling motor vehicles must be made larger; our portions of food made bigger; anti-depression and anti-anxiety medications must be made even more widely available. Of course, to achieve this: The world's resources must be plundered, even faster and more ruthlessly -- which, in turn, causes us to suffer yet more underlying unease, which, in turn, causes us to crave yet more of what has been destroying our peace of mind to begin with.... Therefore: we repeatedly pace the mental cul-de-sac of our circumscribed reality -- our all-American circle of hell. A commodified Hell -- where we endlessly walk in circles, carrying consumer goods on our backs, eternally straining beneath the load of our major appliances, cars, trucks, SUVs, and oversized homes. We buckle beneath the weight of huge retail "big box" stores, vacation resorts, and theme parks, as we trudge through the muck of our mortgaged lives. But, if the American corporate work place, the entertainment industry, and the pharmaceutical cartels have shown us anything, they have shown us that people will not realize that they have been condemned to Hell -- if they have been distracted and medicated into the right state of mind. It would seem that Americans have come to believe that their own particular circle of Hell offers all the amenities of Club Med: The river Styx is brimming with jet skis and recreational boating. There are casual Fridays in Hell and time-sharing damnation. The sign at Hell's Gate should be changed from: "Abandon all hope all ye who enter here" -- to "All who enter here never abandon ye medication." Hell has just gone all to Hell. But the effects of the meds are palliative. Prozac poops-out. Rush Limbaugh's Oxycontin certainties transmogrify into detox deliriums. The Republican Woodstock of Operation Iraqi Freedom becomes the Altamont of Abu-Ghraib. The abyss replies: "It's always darkest right before... it goes completely black." Actually, this is the first hopeful sign -- for the poet is a denizen of the darkness. heavy are the mountains, heavy the seas. If we Americans were to unburden ourselves of the illusion of our exceptionalism, our load would lighten... It would be easier to carry the inherent darkness of being human -- if we endeavored to carry the weight of fewer lies, self-deceptions, delusions, and the other onerous biproducts of our denial. What Does It Mean To Be American? - by Manuel García, Jr.